Landscape art became a popular and highly developed form in Holland from the early 17th century. Working in oils in the open was not possible so scenes were usually sketched on site and painted back in the studio. Pen and watercolour afforded a more practical option and suited a topographic style. 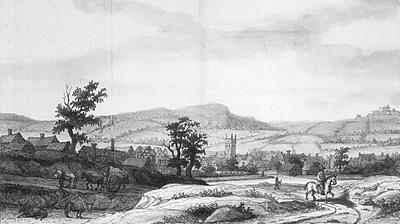 Landscapes did not become part of the British repertoire until the 18th century. It is not surprising therefore that the earliest British landscapes were by visiting Dutch artists. Doomer was a student of Rembrandt but was generally thought to be a better draughtsman than painter. 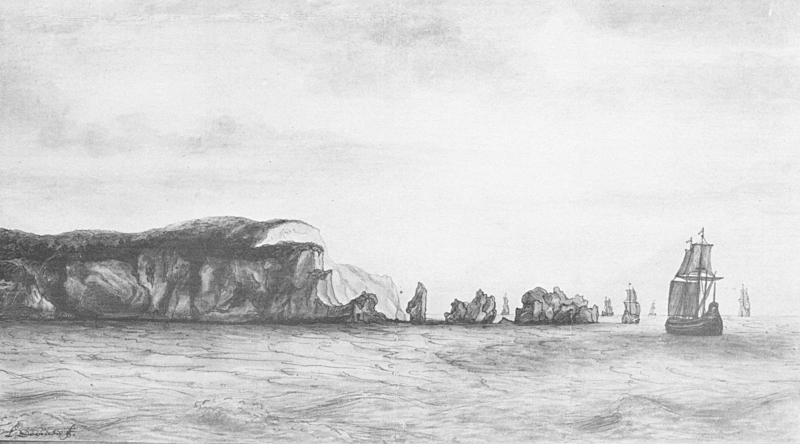 He is best known as an accurate landscape draughtsman, particularly for views of the Rhine and other topographical scenes he made during his various travels. He toured the Loire district in 1646 before coming to England in the same year. Schellinks was a highly regarded artist noted for a range of styles. He visited England in 1662 as part of a four year tour of several countries. His series of English drawings are of a similar pen and wash style to Doomer, although often more panoramic. His scenes suggest a coastal journey from Dover to Bristol. The Island paintings are preserved as part of a remarkable 17th century atlas. It contains more than 2400 maps, prints, and drawings, distributed over 46 volumes. This collection forms a comprehensive exhibition of Dutch 17th century cartographic and topographic art and is retained today by the Austrian National Library in Vienna. The atlas was the lifelong work of Amsterdam lawyer Laurens van der Hem (1621-1678). He began collecting maps and drawings in the 1640s and eventually built a fund of information on everything from geography and navigation to architecture and folklore. It is a mystery why local historians have not discovered these important Island scenes until now. The atlas was researched by P H Hulton in the 1950s at which time the English scenes were reproduced in book form by the Walpole Society. 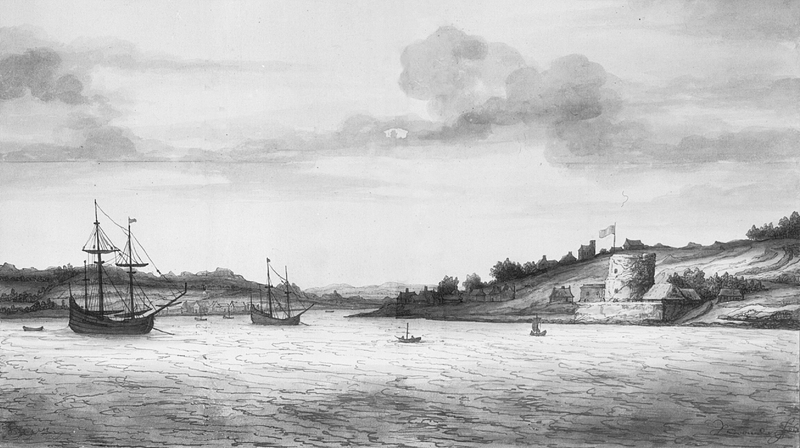 This is by far the earliest image of Cowes Castle. The fort was built as part of Henry VIII's defences and is now home to the Royal Yacht Squadron. The two ships at anchor appear to be Dutch, one of which presumably transported the artist. The line of properties shown on the waterfront at East Cowes indicate a sea defence. By this time, East Cowes had developed a healthy maritime trade. This view is overlooking Towngate pond. The rider's clothing suggests he may represent Doomer himself, heading back to Cowes via Parkhurst. St Thomas' Church and Carisbrooke Castle are the only recognizable features, although the mill wheel by the pond identifies Towngate Mill. This only shows the Island in distant view but it is an intriguing scene. East Cowes can be seen on the left with West Cowes in the centre. The fort on the right is Calshot Castle. The scene does not seem possible from any particular vantage point and is presumably an amalgamation of views, perhaps manipulated to show the position of both forts. Moreover, Cowes Castle is drawn to a larger scale than its surroundings. Schellinks' penchant for recording strategic points around the coast has led to suggestions he was concentrating on scenes of interest to Dutch naval intelligence. One inscription item at bottom right refers to East Cowes built by Benjamin Newland. Schellinks' diary records his visit to the Island in 1662, where he was entertained by Newland. It's possible Newland had some trade with the Dutch merchant who was Schellinks' patron.